“You should’ve seen her,” my husband said proudly. “When the doctor wanted to look in her ears, Belle flicked her hair back and when the doctor said she was going to listen to her chest, Belle pulled her jumper up and breathed in and out for her. She just knew what to do!” Having recently caught a cold, we had taken our two year old to the doctor and this checkup had been a successful one! Why was she so comfortable? I put it down to pretend play. 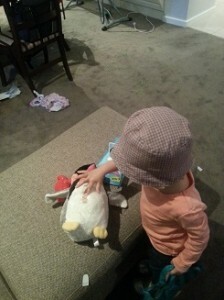 My daughter’s interest in the doctors started from a Peppa Pig episode where they were roleplaying doctors and patients. Belle then developed a love for the nursery rhyme, “Miss Polly had a Dolly” which we have sung a billion times (I’m quite sure this is the correct count!). 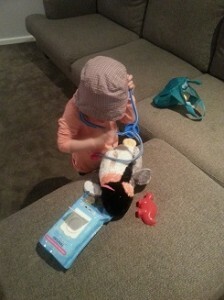 So for her second birthday we found a simple toy medical kit and have had to endure various aches and pains for our Belle to tend to ever since! Pretend Play basically involves pretending to be someone or something else. It also goes under such names as Role Play and Imaginative Play. Pretend Play appears to be a simple activity but it is such an important part to your child’s learning development. The lovely thing about pretend play is that you can prepare as many, or as few, resources as you like. Vocabulary – your child needs to learn more words and pretend play can develop specific vocabulary. Are you playing doctors? Use words like stethoscope, bandage or diagnosis – sure, your child may not be able to say them, but hearing the words in context will help develop their understanding. 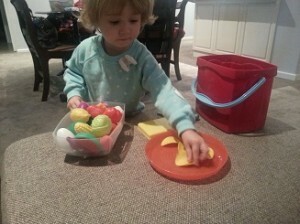 Speech – ever listened to your child playing shops with their toys? You may hear them saying phrases you never imagined they knew! Pretend play helps develop real world conversation skills. Telling Stories – pretend play requires your child to tell stories and recall events. This skill will help them with many classroom activities. Order – talking their way through a play scene will later help your child with their writing. They will have practised organising their thoughts in a logical order which is important to writing. Pragmatics – pretend play can help with learning social conventions – waiting your turn to speak, looking at people, asking appropriate questions and adapting their language to the situation they are in. Taking on the part of someone else can help your child understand how other people may be feeling and that they may have other opinions. If your child’s favourite pet needs to go to the vet or your child needs to go to hospital, pretend play is a terrific way to work through their fears, concerns and questions. Children will learn a lot from just watching and listening to you – scary, I know! The amount of times I have seen children in my class play ‘teachers’ and have my story reading presentation absolutely nailed always floored me! Surely I don’t have such an annoying voice! Ultimately, pretend play is for fun but who said learning can’t be fun? I believe play can be one of the most powerful ways for children to learn. I’d go as far as to say that play is the best learning tool a child could have. So get into it and have some fun!